"I thought this was an actual stop!" When you live in a city long enough, you only see the coffee shop with reliable wifi. You see a map of TD banks in case of a cash emergency, and where to stand on the subway platform to exit quickly at 23rd and 6th. Your pattern of rutted roads and familiar corners extends like a web from apartment to work and back. When you live in a city long enough, you stop seeing it. This is why I rejoice when family comes to town. My city is suddenly born anew, flush with glittering lights and vomit-stained sidewalks. Again I see the corroded metal and claustrophobic streets, grumpy in my admission that too many people live here. Yet I also acknowledge the awe of crossing the Williamsburg Bridge at sunset - something I haven't considered in months with my nose buried in a book or a crossword puzzle - and my heart flutters with tenderness. 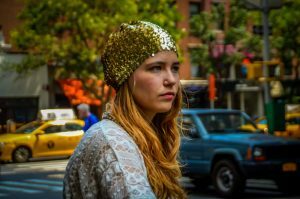 In my grandmother's recent trip to New York City, her first in over 80 years of living, one embarrassing detail of NYC throbbed like a pimple on prom night: the subway. We all know of its delays, its mystifying weekend schedule, its rats and rust and grime. What most of us don't see is the elevators. Rather - the broken elevators. The escalators that are too narrow for a grandmother and a service dog. The button signs for "Mezzanine" that mean absolutely nothing to anyone (since when has a subway platform been a "mezzanine"?). The subways that stop and go so quickly that a grandmother nearly falls onto that sticky floor. Heck, it's so bad that The New York Times wrote an article about ADA inaccessibility as recently as last year. The subway became a fixture of my grandmother's visit, and the topic of nearly every dinner conversation. It became so ubiquitous and defining of the vacation that I insisted on taking them to the Transit Museum where, I hoped, some modicum of respectability could be returned to the MTA's latest failure. "Oh, we're here," my grandma exclaimed once we'd descended the stairs. "I thought this was an actual stop!" We purchase tickets at the quaint booth, and spend time reading about the workers who toiled in appalling conditions to construct the subway tunnels at the turn of the century. Friends, if you live in New York, this exhibit is critical for understanding the history below us. Descend another flight of stairs and you arrive at the platform, complete with warnings not to jump on the tracks due to an active third rail. Vintage advertisements and old-fashioned fans, windows, and seats are ripe for exploration, including historic LolCat jokes such as "Etti-cat says, 'I'm flabbergasted! All I did was to give my seat to a little white haired lady and they pinned a medal on me!'" I wish Etti-cat had been mewling advice when my grandmother rode the subway later that afternoon. Instead, a kind 'Etti-human' had to shout, "Who will give their seat to this old lady?" three times before anyone budged. This gem of a museum continues upstairs with more information than you can consume in an afternoon. There's an exhibit on buses, photo ops with cardboard MTA workers, displays of subway art and activism and line extension plans. Whether or not you choose to descend into the gaping maze of Penn Station, or take pride in the sweeping halls of the Oculus - you recognize that the subway is the heartbeat of this city. Unfortunately, the museum did not have any monuments to broken elevators. We received no answers to our questions about ADA accessibility. 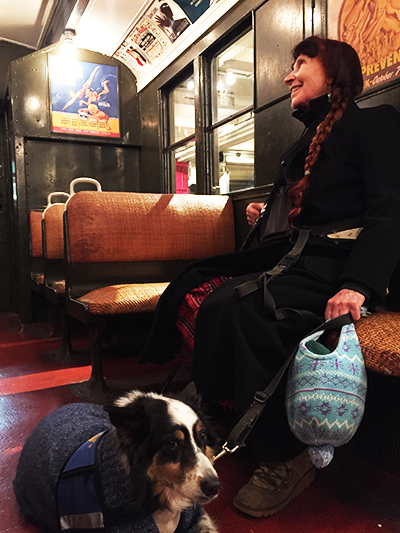 My grandmother and her service dog, Zack, fit perfectly into the 1930s wicker subway seats, but could not find their place easily on the modern 2 commuter train to Harlem. She has aged more gracefully than the subway, and it would behoove the MTA to keep up. Until they do, thank goodness Google Maps allows you to select "accessibility details" when searching a route. My Grandmother, with Uber-Cool Service Dog Zack. Always calm in a crisis. Unless there's a house cat. Must. Chase. House cats.